Bill Harper and Greg Wheeler, eds. Recent work in philosophy, artificial intelligence, mathematical psychology, and the decision sciences has brought a renewed focus to the role and interpretation of probability in theories of uncertain reasoning. Henry E. Kyburg, Jr. has long resisted the now dominate Bayesian approach to the role of probability in scientific inference and practical decision. The sharp contrasts between the Bayesian approach and Kyburg's program offer a uniquely powerful framework within which to study several issues at the heart of scientific inference, decision, and reasoning under uncertainty. This volume draws together new essays from Gert de Cooman and Enrique Miranda, Clark Glymour, William Harper, Isaac Levi, Ron Loui, John Pollock, Teddy Seidenfeld, Choh Man Teng, Mariam Thalos, Gregory Wheeler, Jon Williamson, Henry E. Kyburg, Jr. 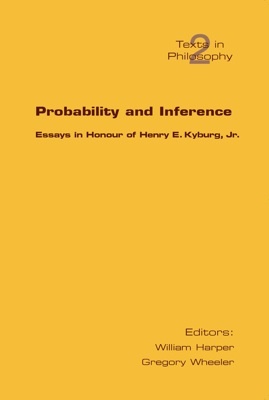 These essays take measure of the scope and impact of Kyburg's views on probability and scientific inference, and include several very promising new contributions to these field.